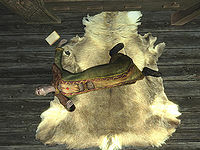 Tova Shatter-Shield is a Nord citizen living in Windhelm. She lives at the House of Clan Shatter-Shield, with the rest of her family. She's married to Torbjorn, the father of her twin daughters, Nilsine and Friga, with the latter having been recently murdered by a serial killer. Tova Shatter-Shield will begin her day at 8:05am by having breakfast for three hours. 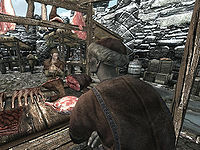 After completing her lengthy breakfast, she will head to the Windhelm marketplace to spend the next five hours of her day. Once her visit to the market it completed, she will head to Candlehearth Hall at 4pm. She will depart for home around 7:10pm, where she will have dinner. Tova will finally end her day around 10pm, at which point she will retire to her bed until 8:05am the next day to repeat her schedule. Tova wears a set of fine clothes and a pair of fine boots. She carries an iron dagger to defend herself. 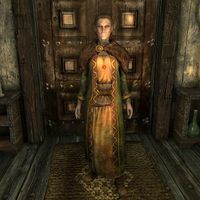 Besides that, she also carries a key to Hjerim, a key to her home, as well as a selection of upper-class items and gold. Approaching Tova will have her mention her grieving over her lost daughter: "I've been a bit out of sorts since... since our daughter was taken from us. ", "No mother should have to bury her daughter. ", "Not really sure what to do with myself anymore. I just miss her so much. ", "I try not to think of her, but sometimes the simplest thing will remind me." Tova will once again become involved with her daughter's killer when you are tasked with bringing the murderer to justice. The guards will direct you towards her to gain access to Hjerim by saying: "Friga Shatter-Shield's old place? It's been abandoned ever since she was killed. I think her mother, Tova, has the key." If Tova is dead, the third sentence in that line will be changed to: "Her mother would have had the key, but she... that family is cursed, I tell you." When you speak to Tova she will initially try to dodge your questions, but will ultimately allow you to say your piece. As long as you ask or demand her help, she will surrender the key. If you chose any of the options but the last one, you will then be given the option to ask her for the key to Hjerim to investigate, which she will give up with the response: "Hjerim? Well, I'm not sure what you think you'll find there, but you're welcome to have a look. " Should her surviving daughter die, she will be overcome with grief. Deciding that she has nothing else to live for, she will take her own life. She can be found after committing the act in her bedroom in her home, with a suicide note, Tova's Farewell, on the floor next to her. Tova: "I understand you purchase used goods, as well as sell them?" Aval: "Yes, that's right. Whether or not I'm interested depends on what you've got, of course." Tova: "I have some things that belonged to my daughter, Friga. She... she won't be needing them any more." Aval: "Oh, I see. Yes, yes of course I'll take a look. Just bring them by whenever it's convenient for you." Torbjorn may ask you not to bother as greeting as part of his quest, Rare Gifts: "I'd appreciate if you don't bother my wife, Tova. She's still in mourning." Asking about her being in mourning will have him ask you to acquire an Amulet of Arkay to bring her comfort over her daughter's death: "Our little girl died recently. I've been shouldering my days with strong mead, but nothing gives my Tova peace. I've been looking for an Amulet of Arkay to remind my wife that our child is with the gods now, but I can't find one." If you agree to and return with one, he will thank you and provide a payment of gold: "I hope Arkay grants my wife some comfort. Thank you. Here. I always pay my debts." Should Nilsine and Tova die, Torbjorn will wonder how much worse it could get as a greeting: "Both my daughters. Now my wife? How much is one man supposed to take?" A scorned friend of their family, Muiri, will want to get revenge against Tova by having her surviving daughter Nilsine murdered, as part of Mourning Never Comes. Asking Muiri why she wants Nilsine to die will have her explain: "Don't you see? I was like a daughter to Tova. A sister to Nilsine and Friga. But the family refuses to believe my innocence. No matter what I say. Couldn't they understand that I was used? That I was grieving for Friga, too? No... they treated me like garbage, threw me away. With Nilsine dead, maybe then Tova will realize what she's lost, hmm? Maybe then she'll see that I was just as much a daughter as the others. And if not, may she drown in her own tears." If you kill Nilsine, Tova will indeed realize what she has lost, her children. She will commit suicide in her grief over the deaths of her daughters. Blood on the Ice: Windhelm is plagued by a shadowy killer. Mourning Never Comes: Help Muiri get her revenge. Although most of the NPCs needed to initiate Blood on the Ice are marked as essential, another quest, namely the Dark Brotherhood quest Mourning Never Comes, will encourage you to kill Nilsine Shatter-Shield. Her mother, Tova Shatter-Shield, will commit suicide if Nilsine is killed, and will therefore render this quest impossible to initiate. This bug is fixed by version 1.2.1 of the Unofficial Skyrim Patch. This page was last modified on 31 December 2015, at 20:19.